But as I sit here right now, peeling my sticky shirt out of my armpits (you are doing it too), baking is the last thing I want to do. You know what I'm talking about.....right? The oven has been locked and banished until the weather cools. So these are the cookies we turn to if we need a treat. I posted these a couple years ago, and I've since made a few modifications which I LOVED. And after I made them, I realized--hey! These are vegan! You are welcome vegan friends. These are quick and easy to whip up on a hot day, and the ingredients are items I always have on hand. They don't have any refined sugar or flour, so they can double as both a cookie or an afternoon snack. In a medium sauce pan mix honey and cocoa. Stir over medium heat until well combined. Add almond milk and coconut oil. Continue stirring, and bring to a boil. Boil for one minute. Remove from heat. Stir in almond butter, vanilla, salt, oats and coconut. Drop by spoonfuls onto lined cookie sheets. We like to put ours in the freezer and eat them straight out! 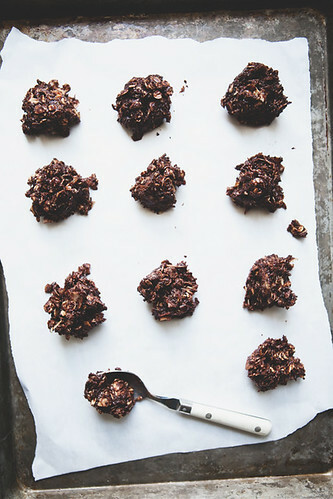 Do you have a favorite no-bake treat? Have the HAPPIEST 4TH of July tomorrow! I love no bakes! I've never thought to make them like this though, I can't wait to try! Have a great 4th! Ok, so I have a question. I know that you eat treats ( and cheese and meat) in moderation, but exactly how often is that for your family? Coming from a home where those foods were literally part of every single meal, I'm having a hard time figuring out what moderation should look like. You read my mind today. haha. We are making no-bakes but I am in the process of transitioning our diets and pantry. This post helped me figure out what to do next time. Today, it's the super not-good for you recipe I grew up with. Does honey count as vegan? We're working toward a more vegan diet (I doubt we'll ever be 100%) and I'm curious about this one. Thank you! I had a craving for no bake cookies yesterday but all I could find online were more unhealthy recipes (i.e. that included 2 cups white sugar!) Will definitely try these. Honey is not technically vegan. Ah, reminds me of my childhood. I and my Mom used to cook things, anything we found along the way home from school. Just pop-out ideas and stuff. It was so fun! Seriously amazing recipe! I have been off dairy since I have realized my baby is intolerant of the stuff even in my milk, so this is a heaven sent recipe as something easy, fast and sweet that doesn't have dairy! Thank you for sharing! Any chance you could substitute something for the oats. 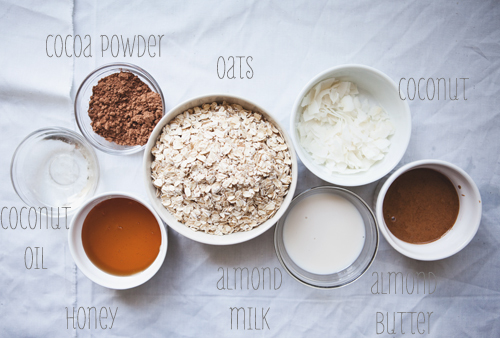 I cannot eat those types of grains, but the rest of the ingredients are so perfect, I wondered if you have a suggestion? Should I use coconut milk?